A prolific artist and craftsman, Moscoso rose to his stance as a DJ in 2006 at New York City’s landmark club Europa. He soon formed Droid Beats with David Rabin, and the duo became known as the “Complextro Bandits.” In this collaboration, Moscoso worked with renowned artists including George Acosta, Devin Martin, Micro and Dank, releasing numerous well-received remixes and original tracks. The time came to return to his underground Trance roots, and when he did, Michael Phase was born. It’s through this name that Moscoso forges his truest sounds to date. Filled with soulful vibes, genre-bending grooves, teasing breakdowns, drops and non-stop screaming, his music promise to carry the mind, body and soul to that special place only the most authentic sounds can reach. This pack is no exception. 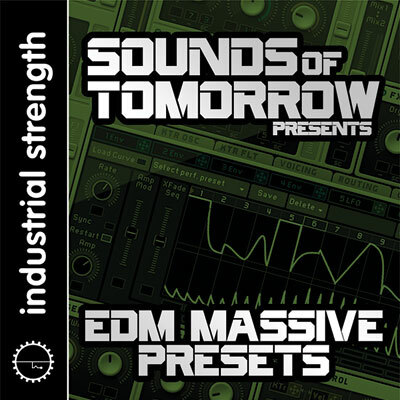 Specially designed for NI MASSIVE VERSION 1.3.0 or higher, it marks the first release in the Sounds of Tomorrow series, a fresh collaboration between Michael Phase and Industrial Strength Samples. As the SOT Series expands, expect incredible sets for the powerful Spire soft synth, along with more audio and preset divinity. The future is truly in your hands—get ready to douse the house in the Sounds of Tomorrow.